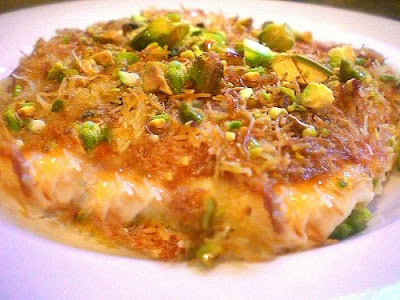 Tickle My Senses: Kanafeh/ Middle Eastern Sweet with Cheese. Kanafeh is also known as Kadayif, Kunefe, Kataifi, Kadaifi originated in the Palestinian city of Nablus and is a feature of Lebanese, Turkish, Greek, and Levantine cuisine. It is a sweet cheesy dish that is truly irresistible. I first tasted this lovely rich sweet at Mr Darwish's house in Muscat at the age of 9. I was so impressed by it that i constantly pestered mum to get the recipe from his daughter Muna. Mum never got around to it. Since i didnt know what it was called, ive never been able to search for it or make it. Until only recently when i stumbled upon it on the internet. I was so overjoyed that within a few hours of finding it..... i had all the ingredients ready and the dish was made. I served this dish to friends who fell in love with it and wanted the recipe. So here it is. I have only one word to describe this dish.......AWESOME. Try it to believe it. This recipe does come with a warning: Calorie watchers Beware. 1. Preheat oven to 170C- 180C. 2. In a large bowl, crumble the kataifi with your hands and then add melted butter and mix well till all the phyllo dough is coated. Place half of the mixture in the bottom of a rectangular glass dish and spread out as a crust, press down to compress. 3. In a large bowl combine the ricotta cheese and chopped mozerella cheese. 4. In a small pan slightly heat the milk for 1 minute and add the semolina and cook for 30 seconds, then add the mixture to the cheese mixture and combine well. 5. Pour cheese mixture on top of the kataifi crust and spread evenly. Place the rest of the kataifi mixture evenly on top of the cheese mixture to form another crust on top. 6.Place dish in oven and cook at 170-180C degrees for 45 minutes or until golden brown. Take out and pour over cooled sugar syrup and then garnish with ground pistachio nuts. Mix sugar and water, boil until slightly thickened ( one string consistency), add either kewra/rose/orange blossom water. Let it cool down before pouring over kanafeh. Your Kanafeh recipe seems so tempting. Is it possible for you to convert the cups or spoon measurements instead of grams. You have truly done a great service to the Mangalorean community. For the Kataifi dough you could probaly use 5 cups. Hope this helps. Do visit again.